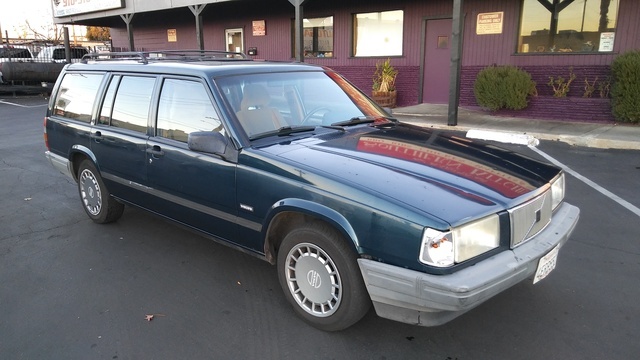 Have you driven a 1992 Volvo 740? Displaying all 8 1992 Volvo 740 reviews. Looking for a Used 740 in your area? CarGurus has 1 nationwide 740 listings and the tools to find you a great deal. Swedish Made Tank — Loyal servant. Easy and cheap to maintain. From 1990 bodies are galvanized so it's fairly rust free. Fairly safe and fuel economy is decent when considering it's engine size and overall weight. Mine has differential lock so it's fun on snow. Cargo capacity is huge and cargo space is 2 meters long when backseats are flipped. Pros: It had it flaws like very rough idle and cp-player drained the battery fast but it never let me down. Cons: It died when VW Vento smashed to drivers side front door. Pros: Very comfortable car to drive around. Built very well and easy to maintain. Has a non-tactile engine so if timing belt breaks then no damage is done to the engine, all you need is a new belt! Good looking car, good for hauling people and anything else around. Built in dog cage in back is extremely useful when traveling with a dog. Interior noise is very minimal. Very good brakes and decent handling. Cons: It is a heavy car. Steering is a little heavy when at low speeds. OHC 8V 2.3L engine is not the most powerful thing so it doesn't jump off the line, but once it gets some revs it pulls pretty well. I Think This Is A Very Good, Safe, Practical, Reliable Car. — I don't like how the car is so heavy. I also don't like how A/C drains the power. However, I do like the way the car drives. It is very comfortable and easy to drive and maneuver. It has many features standard, like 4 wheel disc breaks and 4 wheel ABS breaks. Best Model year for this car. The B230FT engine ran flawless for over 280,000 miles. No major issues. Easy to work on. Performed all my own maintenance and repairs, timing belts, seals, u-joints, brakes, rotors, calipers, exhaust system, tune ups, water pump, etc. Had fuel injectors rebuilt at 220,00 miles, good investment. Only electrical problem was the grounding plate on the drivers side firewall, needed cleaning after 220,000 miles. No vehicle corrosion, paint was solid, no rust through 19 New England winters. Gave it to my neice who loves it. Still runs great. No turbo problems, no transmission problems. Only problematic issue was water getting into the heater blower and rusting it. Did change out the temperature controller due to an arced connector plug. Held tires and front end alignments well. Three sets of tires in 276000 miles. Would love to have another one. Did require snow tires though, because when the turbo kicked in the rear end came around on wet pavement/snow. Lots of power, very fast on the highway, no problem getting out of the way and fantastic handling. Turns on a dime, stops on a dime. Nothing bad about this model year or model, period. Built in Belgium. Averaged 25-27 miles per gallon at highway speeds 65-80. would have liked to have power seats, but seating was very comfortable. loved the sunroof and roof racks. great car to own and drive. Pros: Fast, Good on Gas, ROOMY! I bought this car in 2005 with a hair over 100,000 miles on the clock. The photo shows the car as it was when I first bought. 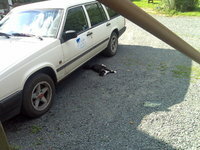 It was a nice looking car in good condition, and the Volvo reliability reputation was a clincher for the sale. Well, things went downhill and fast. Within a few months of purchasing the car, the turbo began overheating, electronics went haywire, the exhaust rusted like crazy, the exhaust manifold seals blew out, and the drivers door literally fell apart. The entire door frame rusted out in one year, the window stopped working, and the replacement motor was ridiculously expensive...so much so I decided to go without a working window. Gas mileage with this car was poor, even with a light foot on the pedal and ginger use of the turbo. If I got mileage in the high-teens, it was a good day. Repairs were costly and far too frequent. The interior, which at first looks quite nice, is actually made of some of the cheapest plastics I have ever seen in a car. Also, the leather rips and cracks easy. I know people who have had Volvos live up to their reputations of being high-quality cars, but this particular car was no such automobile. After two years I gave up on it altogether and traded it for a 2005 Kia Sedona LX, which is a million times better. While I would not automatically right off Volvos altogether, the experience I had with my 740 Turbo Wagon has given me serious doubts as to whether I would buy another Volvo, especially a used one. Pros: Turbocharged 2.3L I4 engine propels this station wagon faster than any wagon has a right to. Handling was also rather good. Cons: Frequent mechanical and electrical malfunctions, costly replacement parts, cheap interior, body and paint poorly-protected from the elements (i.e. paint peels and car rusts easily), horrendous gas mileage, terrible in snow (which is ironic since it is a Swedish car).